I bought one of those low cost Z gauge locos and an oval of track. Radius is about 45mm, yes mm not cm. The loco is what the maker Rokuhan call a shorty, and is in same price bracket as Kato units. Now 6.5mm gauge works out close to 15in gauge in 5.5mm/ft(1/55) and as I have been planning various gauges in this scale, I thought should start one. The motorized unit is small, bogied and runs pretty well. Suspect it is low voltage as my controller was only just on and it moved. Probably will use a battery pack to run it. Although they do a non powered bogie unit, I prefer some simple 4 wheel units. Marklin wagons are not cheap, so am thinking of reducing gauge on some N gauge wheels(sliding along axle). The ovalis only about 7in long by 5in wide, and I have some cake boxes for that BRM challenge. 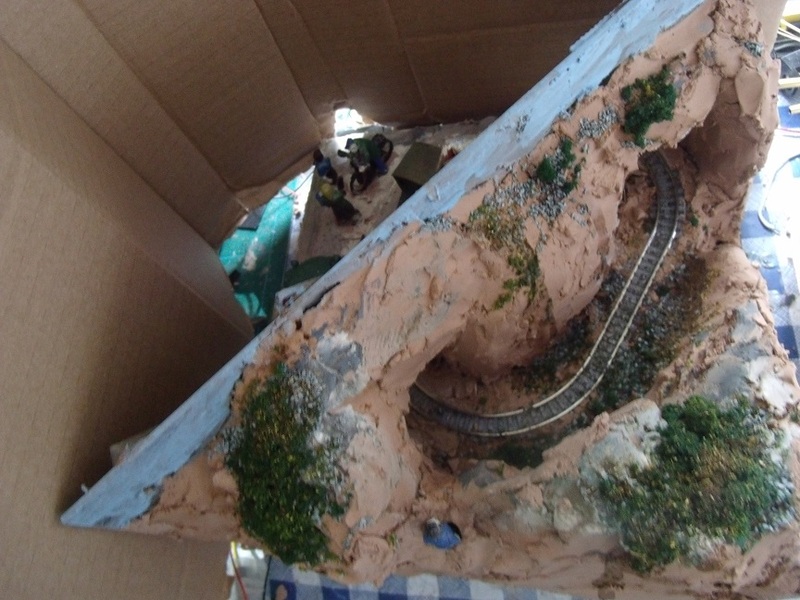 It fits in box easily, possibly could have had more track, but as a first time experiment enough. If this works, and I am not distracted by something else, I may build something bigger, using my own 3D printed inset track. Last edited by rue_d_etropal on Mon Jun 25, 2018 9:54 pm, edited 2 times in total. Any pictures? Love to hear more about this. Also who is the manufacturer? It's my RR and it exists,in my mind!!!!!!!! https://www.ebay.co.uk/itm/Rokuhan-SA002-1-Z-Shorty-Powered-Chassis-Shinkansen-Type-1-220-Z-Scale/352357443580?epid=21012527110&hash=item520a23e7fc:g:zTkAAOSwSFJaep9D There is another version SA001, not sure on exact difference,but looks very similar. They sell out very fast, and PlazaJapan are the cheapest source. Have seen people selling them for twice the price! I was wondering about a loco body, and then found I had one of Tom's centre cab locos for OO9. It is just the right size, with room for driver to sit inside. Wagons - started to regauge some Minitrains hoppers. Carefuly remove wheels, and file down centre part of axle as it is slightly thicker(set to 9mm gauge b2b). I had a quick test with one wagon and loco pushed it round, no problem. Granted there are n points so b2b might not be quite right yet. The hoppers are possibly a bit small,but the Peco ones would need a whole new wheelset, and I could not find any conversion sets. Odd that as I would have thought there were people using 9mm gauge stock on 6.5mm gauge. After trying to get password reset, for some reason nothing got emailed to me when I requested a newpassword. But, I found my old password, and it works, so now I can post a coule of pictures of my 55n15 mini layout. Mre cake than pizza, as it fits in a cakebox. I suspect you'll find the motor is 3V, I've just picked up a Buch HOf mining set (3.5mm scale - 6.5mm gauge), and that is 3V. 'Normal' Z scale stuff is 9V. I tested it on 2 1.5v batteries and it still moved a bit fast. On one battery it was too slow, so suspect somewheee inbetween. 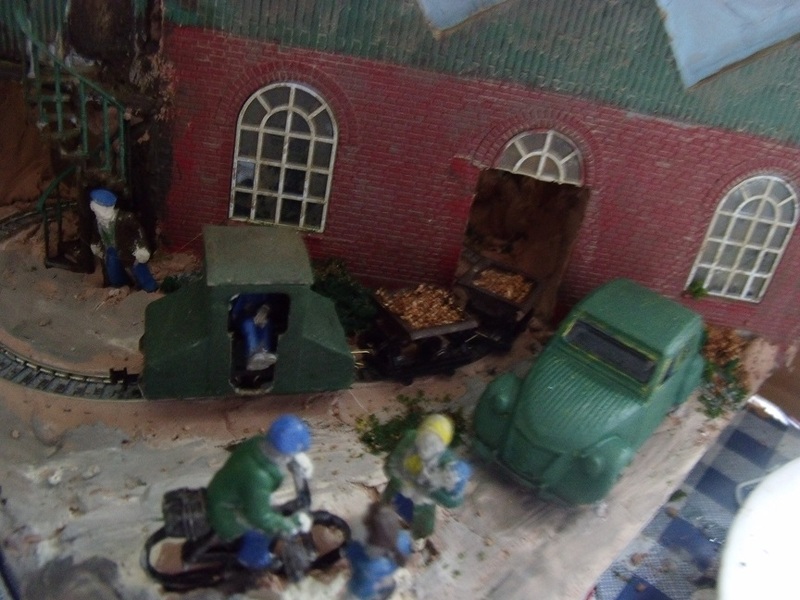 That was before I built layout, so need to test again, now its done and motor nicely worn in.